Toss steak with 1 Tbsp. of the dressing. Let stand 5 min. to marinate. Stir-fry steak mixture in hot oil in large nonstick wok on high heat 2 min. Reduce heat to medium-low. Add vegetables; stir-fry an additional 4 min. or until steak is cooked through. Add remaining dressing; simmer 2 min., stirring occasionally. Serve over the rice. This recipe works well with a variety of vegetables - try substituting drained canned baby corn, chopped bok choy and/or green beans for some or all of the vegetables listed. Substitute cleaned shrimp, chopped chicken, cut-up pork or tofu cubes for the steak. 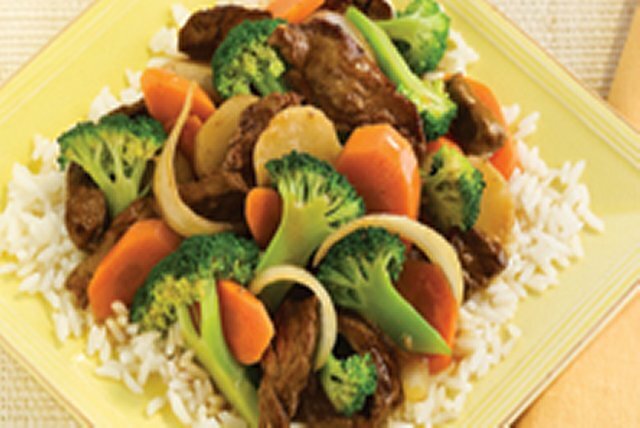 This flavourful dish is an excellent source of vitamin A thanks to the broccoli and carrots.